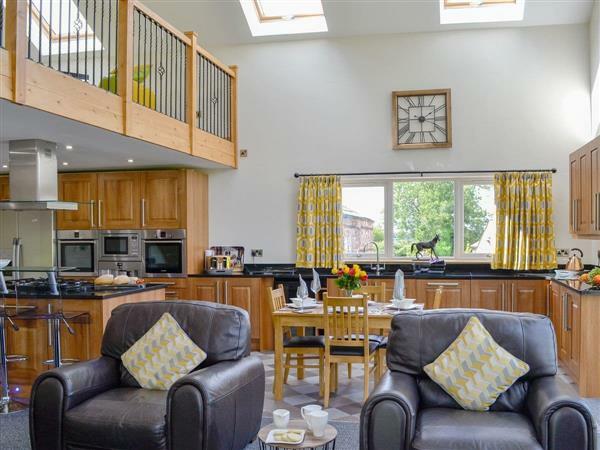 Holmegarth in Arkleby, near Aspatria, Cumbria sleeps 4 people. Holmegarth near Aspatria is a beautiful, modern luxury barn conversion with stunning views towards the Scottish mountains and is the ideal romantic getaway. It is close to the sea on the owners’ family friendly development and is situated on the edge of the village of Arkleby. Set with other holiday properties, this is an ideal area for exploring Cockermouth and the northern fells and lakes. Enjoy stunning scenery without experiencing the same hustle and bustle of the central Lakes. There is everything you need for a family getaway including a hot tub, and shared use of a superb, indoor pool with sauna and spa within the courtyard. The property has lovely outlooks over farmland towards the Solway Coast, 4 miles away. The market town of Cockermouth is 6 miles, Keswick, 14 miles, Buttermere, 12 miles, and Bassenthwaite Lake is 6 miles. Private fishing on the River Ellen for salmon and trout is 1 mile away and is free of charge. Golf and horse riding are nearby. The beach is 6½ miles from Holmegarth near Aspatria. With the shop 2 miles, and the pub & restaurant are 1 mile from Holmegarth. Open plan living space: With wooden floor and patio doors leading to patio. Living area: With multi-fuel burner, Freeview TV, DVD player and CD player. Kitchen area: With breakfast area, 2 electric cookers, gas hob, fridge, freezer, dishwasher and beams. Bedroom 2: With zip and link twin beds (can be super king-size on request), Freeview TV and en-suite with bath, shower cubicle and toilet. Oil central heating (underfloor on ground floor), gas, electricity, bed linen and towels included. Initial fuel for multi-fuel burner included. Travel cot and highchair available on request. Welcome pack. Patio with garden furniture and barbecue. Hot tub (private). Indoor heated swimming pool (shared, depth 1.2m, pre-booking essential, an extra cost for private use) with sauna and shower facilities. Private parking for 2 cars. Wheelchair access. No smoking. Holidays at Holmegarth run from Friday to Friday. For a better idea of where Holmegarth is, you can see Holmegarth on the map below. Holmegarth is in Cumbria; should you be on the lookout for a special offer, you can find all the special offers in Cumbria. It's always worth checking to see what is on offer at the moment. Do you want to holiday near Holmegarth (UKC3324), you can see other cottages within 25 miles of Holmegarth; have a look to find your perfect holiday location.